I want to embrace the non-systemd world of new or forked Linux distributions, but I still want to understand and be competent with the "popular" distributions which use it. It looks like Devuan took all the nice people from Debian!!! Every single one!!! So. Enough said. I love everything Devuan, but you really should have left a few nice guys behind when you split. Attached, please find an example of the current state at Debian Forums. Sorry about that, but we didn't get to choose who left and who didn't. If we did have that power, we would have taken a few more. But it turns out that would not have been necessary - they're coming around eventually. First year, we got all people who didn't want systemd, but as time goes by, we keep getting more people who thought they did want systemd and changed their minds after they got it. P.S. Also sorry I didn't see your post a year ago. I don't think I've ever had two installs come out exactly the same with debian-installer. //edit: Some of the packages in question were in the security repository (exim4 among them). Updates to packages there might have been a possible cause, but it's hard to say for sure. I know what you mean. 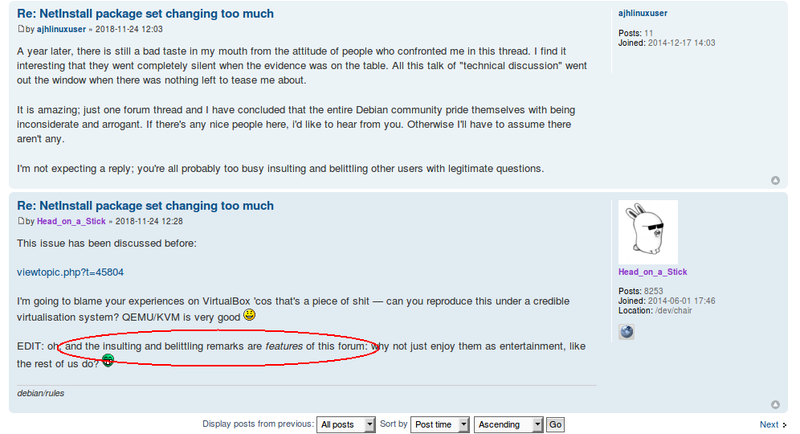 I have never encountered a more gratuitously user-hostile tech forum than Debian Forums. Even in the Beginners subforum, asking a simple question, even just trying to ask if something is a known issue, opens yourself up for all sorts of abuse, insults, mockery, etc. I don't understand how people get like that - seems it would be a miserable existence. Oh well. cynwulf wrote: "You should get some more sleep and spend less time on forums." In all fairness, in drawing on what little that I personally know of Head_on_a_Stick, he is a very nice, courteous, and helpful individual. As such, though it may not be obvious to those unfamiliar with him, I interpret his response as an attempt to add humor to the thread. It depends on how you've encountered him tbh. You guys have history in a way that a lot of users just don't. Doesn't make either of you horrible people imo. Just highlighting his real persona - (also by his own recent admission on DUF). I posted worse things than that at FDN back in the day. If you look specifically at the comment headstick responds to, his response is IMHO somewhat warranted. Men and women. Girls and boys. Do not be to sensitive. And what about this user (headstick). He helped many people. It is therefore a very valuable forum member. In addition, in his speeches, there is a great deal of humor. Men and women. Girls and boys. Do not be to sensitive. To me it speaks volumes that someone will return to a thread over a year later and still having a problem with that thread and those posters, then go to another forum and post a tailor made screenshot, soliciting comments about how nasty the FDN forum is... well you should have seen it 7 + years ago. To his credit, headstick has helped people out at that site, but it's a thankless task, burnout is inevitable... once burnout occurs, the FDN celebrity assholes gallery beckons... it's then up to the burnt out remains to resist the lure. Both of you do have an interesting post history, in your own contexts, at FDN. Your reputation is quite notorious. That said, if there really is some kind of user-based fanclub for any user, please remove me from the mailing lists. I was thinking to some DUF posts that I read awhile ago and it seemed like there was a serious feud between him and a few other members. No that's just normal run-of the mill behaviour for DUF. Your reputation is quite notorious. Eh, what did I do...? Just FYI, someone posted a link to this thread in Debian User Forums/General Discussion.